Heads of state in the Southern African Development Community and those of countries resorting under the International Congress of the Great Lakes Region condemned recent violence that broke out in the run up to general elections in the eastern parts of the Democratic Republic of the Congo. The President of Namibia, Dr. Hage Geingob, in his capacity as Chairman of the SADC, led a delegation of heads of state to a attend the joint summit with heads of state ICGLR in Brazzaville on Wednesday to find urgent solutions to the current challenges experienced in the DRC. In a joint communiqué issued after the mini summit President Geingob condemned the armed attacks by certain faction groups in the eastern regions of DRC against civilians and members of the United Nations Stabilisation Mission. President Geingob was invited to attend the conference by Denis Sassou N’Guesso, President of the Republic of Congo and current Chairman of the ICGLR. Other head of state that attended were Edgar Chagwa Lungu, the president of Zambia, Joao Manuel Goncalves Lourenco, the president of Angola and Dr Mokgweetsi Eric Keabetswe Masis, the president of Botswana. Other delegates who attended included Richard Sezibera, Minister of Foreign Affairs and International Cooperation Rwanda, Abel Mxolisi Shilubane, Ambassador of South Africa in DRC, Major General Julius Chihandae, Charge d’Affaires Uganda and Congo residing in Kinshasha, Ambassador of the African Union in the DRC and Chairman of the Commission of African Unity, Amba Abdou Abarry and Ambassador Berthe Eliane Mokodopo, Deputy Executive Secretary of the ICGLR. 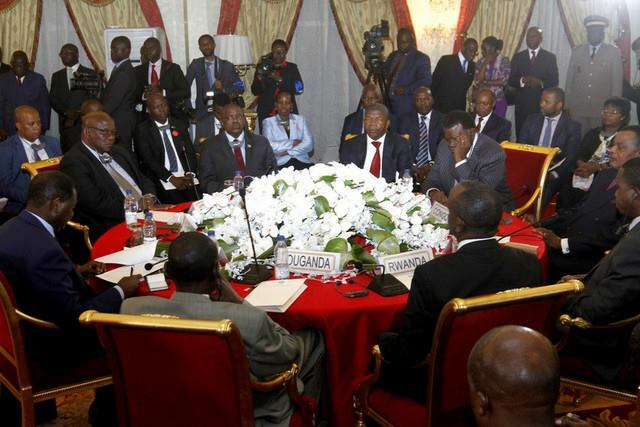 According to the joint communiqué the various heads of state considered the current political and security situation in the Great Lakes Region and the SADC. In this respect all who attended reaffirmed the importance of peace, security and stability in these regions which hold the key to eventual development. With respect to the electoral process in the Democratic Republic of Congo, the delegates raised their deep concerns in view of the recent acts of violence which occurred during the electoral campaign in some regions and that these violent actions may compromise the conducive environment needed for the holding of the elections in the DRC. 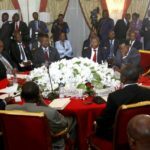 The heads of state strongly encouraged the government of the DRC to ensure security is given to all candidates in the upcoming elections. They welcomed the start of the DRC’s electoral process as well as the opening of political space in the DRC and strongly condemned the acts of violence perpetuated in the eastern parts of the DRC by armed groups against civilians and the UN Stabilisation Mission in the DRC. The delegations reaffirmed their commitment to the holding of peaceful, free, democratic and transparent elections in the DRC. The Heads of State called on all political parties and civil societies to exercise restraint in order for the elections to take place peacefully. Due to the recent unrest and violence the presidential, legislative and provincial elections was postponed to the 30th December 2018. The Heads of State also welcomed the deployment of observation missions by the African Union, SADC, ICGLR and the Economic Community of Central African States (ECCAS) in this period leading up to the elections. All who attended expressed their satisfaction in the role that the African Union played in finding solutions to the issue in the Great Lakes and SADC Region and assigned the current Chairperson of the African Union Commission to keep working on peace, security and development of the concerned countries. President Geingob also called on the international community to fully support the DRC government in their fight against the Ebola epidemic and all attending expressed their solidarity and compassion towards the victims of Ebola in the Beni Region of the central African country.